Today in the Supreme Court of Justice Adolph Lucas, a jury of 7 women and 5 men found Lavern “Anti-Christ” Longsworth, 38, guilty of the murder of David White, 32. Longsworth was accused of throwing kerosene on White, her common-law husband, and then throwing a candle on him, which set him on fire on July 15, 2010 while they were at home. Although White didn’t die immediately, he did eventually succumb, on August 2, 2010, to the injuries he sustained at her hands. Longsworth was not charged with his murder until December 14, 2010, four months after White died. She was, however, charged with attempted murder on July 19, 2010, four days after the incident. The trial, which started on October 9, was unique, to say the least, when it came to murder trials. For one thing, at trials the jurors are normally told not to pay attention to any account of the incident they see on the television, hear on the radio or read in the newspapers. But this time, television personnel took the stand as witnesses for the prosecution. The Crown, represented by Sheiniza Smith, called to the stand a slew of media personnel who had conducted television interviews with Longsworth after the incident. Called as witnesses were even those persons who merely edited the material that eventually made it on the newscasts. In those interviews, Longsworth spoke candidly of what occurred the night she and White were at home. She told the interviewers that she was at home with White, and that he asked her for $10. She said that they started arguing and he left the house. When he returned, he had a bottle of kerosene that he brought into the room. She said that White normally had a knife with him when he would smoke his crack cocaine, and that is what he was doing that night. She said they continued to argue, and she saw him make a move as if to take out the knife, and she got scared. That was when she reached for the bottle of kerosene, threw it on him, and threw the candle on him, which set him ablaze. Dr. Manuel Paguaga, the attending physician, testified that when White was brought into the Karl Heusner Memorial Hospital, he was conscious and his mental state was normal, but he complained of a lot of pain. He further testified that the cause of White’s death was multiple organ failure and infections, as his kidneys, lungs, brain, and liver were affected by the burns he sustained. The infections he died from were because his immune system could not protect him. Dr. Mario Estradabran, the forensic pathologist at the KHMH, also testified as to the condition of White’s body when he conducted a post-mortem on him. He said he observed burns on his chest, abdomen, arms, lower extremities and back. He said that White’s brain was congested, meaning that it was discolored, and his windpipe, food pipe and lungs were also congested. He told the court that in his opinion, the cause of death was acute pulmonary edema due to multiple organ failure due to burns. Longsworth gave a dock statement, in which she told the court that she knew she had done something wrong, but she was only trying to protect herself and her children. She also told the court that it was not the burns that killed White; instead, it was the sickness (HIV) that he gave to her that killed him. She said that she was sorry for what she did, and since being locked up in 2010, her children are suffering, including her now 15-year-old son, who is blind. Longsworth’s attorney, Kevin Arthurs, then called three witnesses to testify about White’s character and the ordeals that Longsworth had endured during their relationship. The first witness was PC #5 Linsdale Blease, an officer attached to the Family Violence Unit of the Police Department. He testified that he had received two oral reports from Longsworth, the first being a report that White had removed her television set from her house. The second report he received was from their control room, which led them to visit Longsworth’s home on Castle Street. He testified that when he and the other officers arrived, Longsworth was visibly upset, claiming “Dis bwai chancey!,” referring to White. However, none of this could be proven, since PC Blease didn’t log it into his police notebook, or anywhere else, for that matter. He did also testify that Longsworth had confided in him on several occasions, telling him of her trials with White. Arthurs’ other two witnesses testified of White’s criminal history and convictions. He then closed his case. Although Longsworth and Arthurs never denied that she had set White on fire, their defense was that she was acting in self-defense, after years of being abused. In order to prove murder, the Crown had to prove that (1) David White is dead; (2) White’s death was caused by harm; (3) the harm he died from was unlawful; (4) Longsworth caused the harm unlawfully; and (5) when Longsworth caused the harm, her intent was to cause White’s death. The alternative manslaughter charge was also an option for the jury to consider, once they believed Longsworth’s account of what took place that night on Castle Street. The jury retired at 12:21 p.m. and after a period of only 3 hours, returned at 3:27 p.m. with a verdict of guilty of murder, and not the lesser charge of manslaughter. 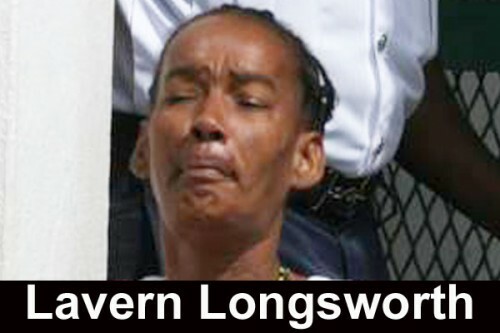 A mitigation hearing will take place on November 8, 2012, after which Longsworth will be sentenced.